Usually, I’m up at the crack of 9 a.m. on Thanksgiving morning, tuning in to “March of the Wooden Soldiers” (1934) starring Stan Laurel and Oliver Hardy on Channel 11. But for the last three years, I’ve actually been competing with Laurel and Hardy … for TV ratings. Since 2013, I’ve been having a blast as a balloon handler for the Macy’s Thanksgiving Day Parade in New York City. It’s the best stroll through Manhattan you can imagine. My first choice of balloon is Bullwinkle (retired), but I now have a bond with the Elf on the Shelf. This year, I was assigned to the Elf on the Shelf, which was considered a promotion. The first two balloons I helped guide — Yes Virginia and Harold the Fireman — were smaller balloons (with smaller crews) that required no accompanying vehicles. 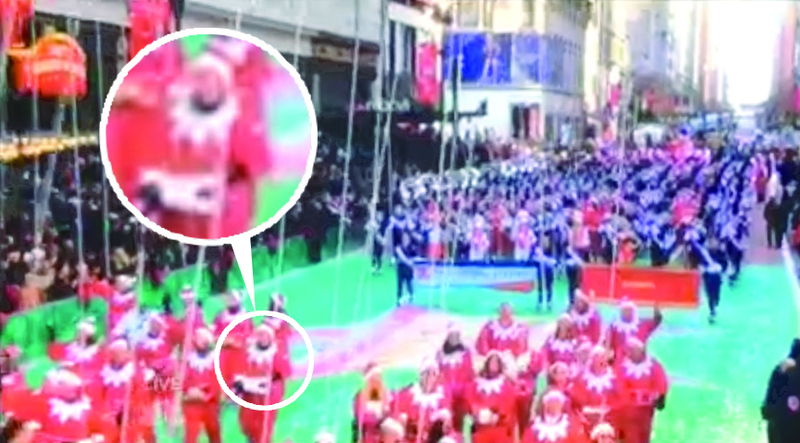 But the Elf — “taller than the White House,” according to the NBC announcer — had 90 assigned balloon handlers, and was accompanied by a shiny black Toro cart. Also, the Elf is a magnet for crowd reaction. Kids dig him. Sorry, Stan and Ollie. I grabbed some air time. Didn’t you notice me? I swear by this miracle cure. Thanksgiving 2015 was a downright balmy day. The overnight low was in the mid 40s. The high was near 60. It was sunny out. You saw lotsa people without hats and coats (which sure wasn’t the case in 2013 or ’14). This was a lucky break for me, because all week prior, I had been fighting a painful sore throat, using Vitamin C and Bragg Organic Raw Unfiltered Apple Cider Vinegar With The Mother, a miracle cure which I now swear by. (Although, I’m still afraid of what “The Mother” might be.) I kept my cold at bay, and made the parade. Yay. 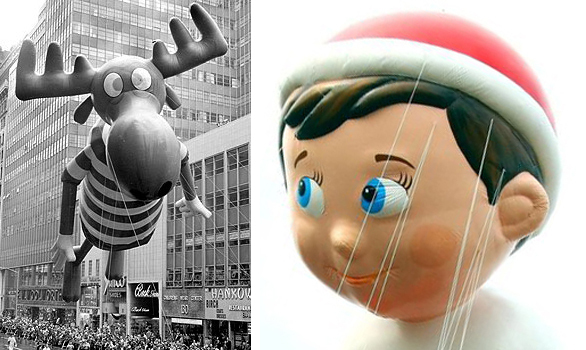 The Elf was near the end of the parade — the final “proper,” full-size balloon before Santa’s sleigh. (Yes, Santa was preceded by a candy cane balloon and three small Macy’s elf balloons, but these are relatively tiny, and their proximity to Santa is by design.) Being later in the parade translated into a longer day — a later launch time, more competition with departing tourists for transportation, and less post-parade danish and coffee. My line on the Elf balloon was the one tethered to his right foot. This was a tricky line for one person. Whenever there was a breeze, the Elf seemed to pivot on this point, so my line would be all over the place, and it was my problem alone. I seem to have a gift for acquiring tricky lines. It keeps the day interesting. Now I can say that Mariah Carey once opened for me. Last year, Kiss was in the parade. This year, Mariah Carey was on a float. So now I can say Mariah Carey once opened for me. So to speak. Immediately behind us was the “Marching Illini” — the University of Illinois Marching Band. They had two baton twirlers who were crazy-talented. These girls were making the batons roll all over their necks and shoulders like animation. The girls would throw their batons high in the air, like spinning blurs, and catch them effortlessly, synchronized to one another perfectly. Plus, they were lovely, athletic young ladies in spangly costumes. You could not look away. Which triggered one moment of mild human comedy. But on a couple of occasions when we were momentarily stopped, quite a few guys flagrantly broke this rule; they were completely turned around, eyes glued to the baton twirlers behind us. (Okay, I was among the offenders.) Even the fellas in black overalls who manned the Toro cart were watching the girls instead of the pilot during these brief stops. Bonus: Click HERE to see the Elf on the Shelf from NBC’s live broadcast (courtesy of my darling sister-in-law, who captured the moment while dealing with turkey gizzards).